Following the success of last year's Hadrian's Wall walk, we decided to do something similar with Peter and Rachel again this year ... but somewhere the weather could be relied on. Ha! Prior to our Camino, we spent a couple of days in Madrid. Peter found an excellent hotel, Hotel NH Príncipe de Vergara, in the Salamanca district, well placed for the metro. And with the good value rail passes and Rachel in charge of route planning for the weekend, we managed to use all 10 of the central metro lines. We went to the Parque del Retiro twice - this really is the lungs of the city, and very well used by the locals as well as us tourists. The Sunday market in El Rastro was also an experience - so many people. The sleeper from Madrid to Ferrol took almost 11 hours, arriving at about 9:30 on the Monday morning. After checking into our hotel, Hotel Carris Almirante, we had the whole day to explore Ferrol. Camino Day 1: 19.2 miles. We'd completed the first mile of our Camino the previous day, but this was still a long day's walk. As the crow flies, Pontedeume is only about 6 miles from Ferrol, but we had to walk right around the Ria de Ferrol inlet. The weather wasn't too bad, and although some of the scenery was a bit industrial, it was pretty interesting. Camino Day 2: 13.0 miles. 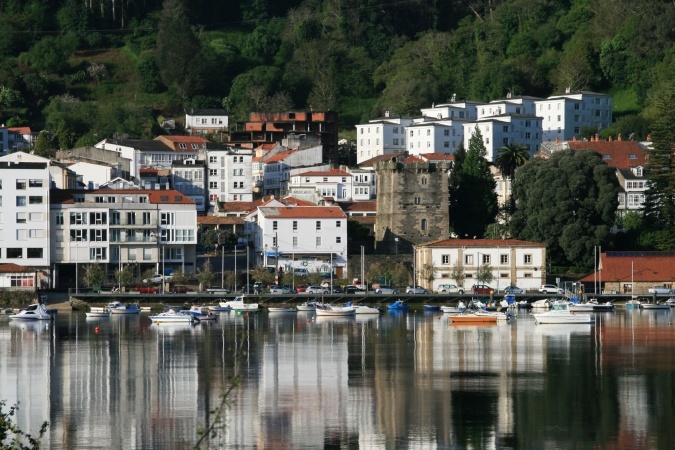 After the previous evening's rain, we set off in glorious sunshine on a shorter stretch to Betanzos. We stopped briefly in Pontedeume to get our Credencials stamped at the police station. The weather kept us guessing, but on the whole a really nice day's walk. Camino Day 3: 22.3 miles. This was our longest and hardest day - with a couple of long climbs and a bit too much walking on the roadsides - and it hardly stopped raining! (Hence, not too many photos). Camino Day 5: 7.4 miles. The last stage of our Camino took less than 3 hours - a nice gentle finish through some pleasant countryside before hitting the outskirts of Santiago. Yes, it rained a bit, but how else are you going to get photos of a rainbow? Having checked into our hotel, the Hostal Dos Reis Católicos (Hotel Parador de Santiago), we had plenty of time to explore Santiago. One of the reasons for setting off so early, was to arrive in time to attend the Pilgrim's midday mass in the cathedral.